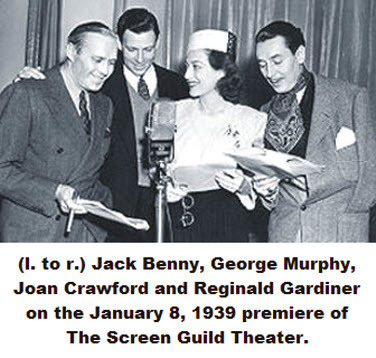 The Screen Guild Theater was a popular radio anthology series during the Golden Age of Radio, broadcast from 1939 until 1952, with leading Hollywood actors performing in adaptations of popular motion pictures such as Going My Way and The Postman Always Rings Twice. The show had a long run, lasting for 14 seasons and 527 episodes. It initially was heard on CBS from January 8, 1939 until June 28, 1948, continuing on NBC from October 7, 1948 until June 29, 1950. It was broadcast on ABC from September 7, 1950 to May 31, 1951 and returned to CBS on March 13, 1952. It aired under several different titles: The Gulf Screen Guild Show, The Gulf Screen Guild Theater, The Lady Esther Screen Guild Theater and The Camel Screen Guild Theater. George Murphy hosted the show in 1939. In 1940, Roger Pryor began hosting the show. The show began as a general variety show and later changed formats to include old time radio versions of popular films. It starred most of the big name Hollywood celebrities of the time. Actors on the series included Ethel Barrymore, Lionel Barrymore, Ingrid Bergman, Humphrey Bogart, Eddie Cantor, Gary Cooper, Bing Crosby, Bette Davis, Jimmy Durante, Nelson Eddy, Douglas Fairbanks Jr., Clark Gable, Judy Garland, Gene Kelly, Johnny Mercer, Agnes Moorehead, Gregory Peck, Fred Astaire, Frank Sinatra and Dinah Shore. 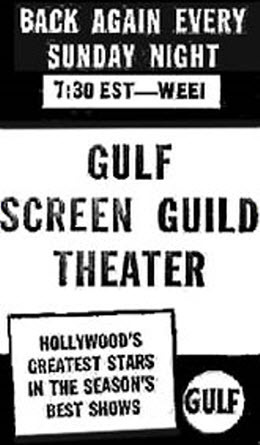 Fees these actors would typically charge were donated to the Motion Picture Relief Fund, in order to support the creation and maintenance of the Motion Picture Country Home for retired actors. The series came to an end on CBS June 29, 1952.